Giant Bulbs for the Late Spring Garden | Florissa - Flowers and more! The late spring garden transitions towards the full blooms of summer. Include a few of these spring flowering bulbs in your fall planting and your garden will continue to flower on the heels of spring’s prime time bloomers. Often called ‘bridge’ plants, these varieties are gentle, towering giants that offer exceptional beauty and striking border combinations with delphiniums, peonies, and iris germanica. They’re beneficial for our pollinators too as these bulbs are great nectar-rich food sources. Huge vibrant pink blooms with crisp white edges – Tulip ‘Jumbo Beauty’ is a megastar. Giant beauty tulips are bred for their unusually large size. Tall in stature with long, slender and sturdy stems, ‘Jumbo Beauty’ showcases classic goblet shaped blooms. 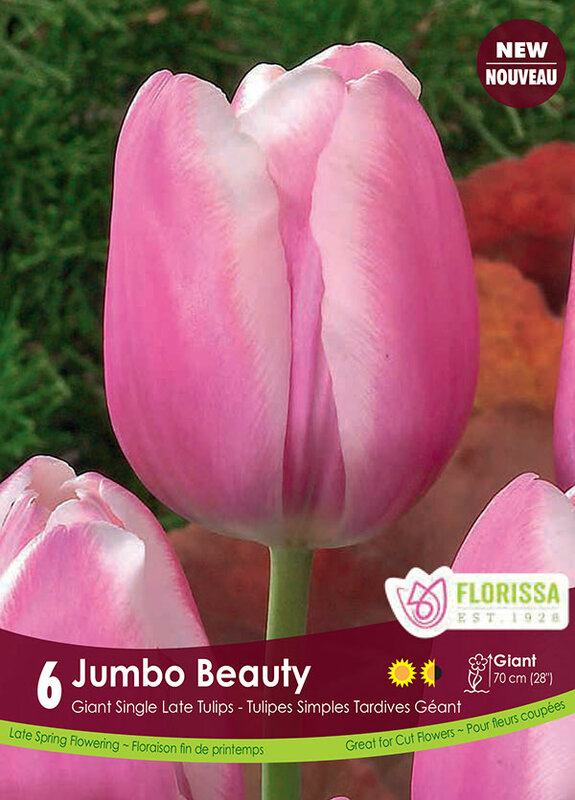 Growing 70 cm (28”) in height, these tulips are ideally situated towards the back of the border or flower bed. They would also look great along a fence or hedge for the best visual impact. Plant the bulbs 15 cm (6”) deep and 10 cm (4”) apart in full sun to part shade locations in fertile, well-draining soils. ‘Jumbo Beauty’ blooms from late April to May and makes an outstanding companion when planted among peonies, roses and alliums. An excellent cut flower, it is a stunning addition to floral arrangements. Hardy to Zone 3. A magical garden globe that truly brings life into the garden. Allium ‘Globemaster’ is brimming with densely packed, small, deep lavender florets that collectively gather to form a 25 cm (10”) sphere. 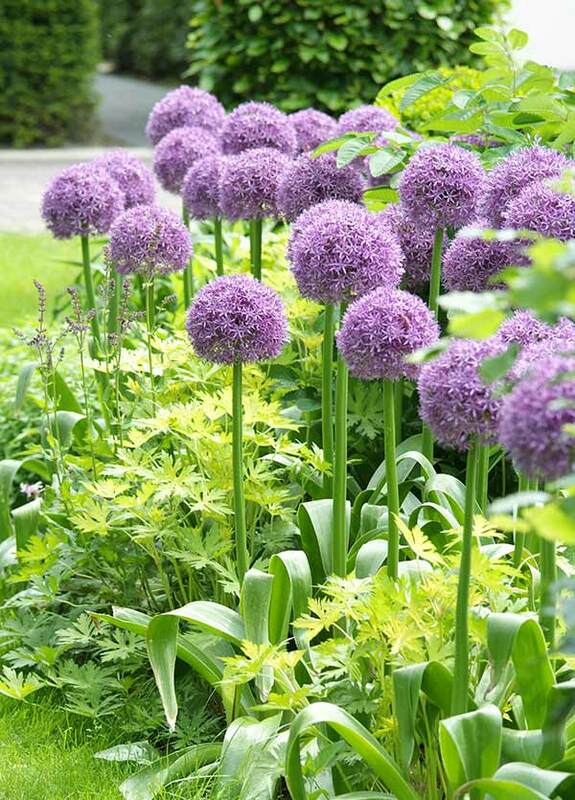 One of the largest flowering alliums, it is a cross hybrid between alliums christophii and macleanii, and many think it is one of the best, especially the adoring bees and butterflies. Having received the coveted RHS Award of Garden Merit, ‘Globemaster’ adds an unusual structural effect to the garden: the giant spheres look like silvery purple floating bubbles blown from a wand. Alliums are ornamental onions, and their foliage when crushed has an onion-like fragrance, but the flower-heads are unscented and make excellent cut flowers. Terrific in the border among giant beauty tulips, ‘Globemaster’ is also a good companion among roses, helping ward off unwanted pests and disease. 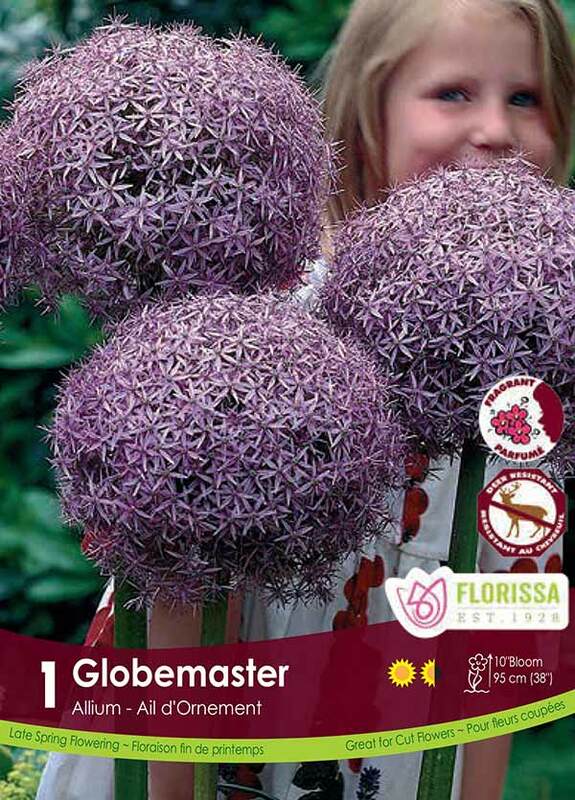 Deer and rabbit resistant, this allium grows to 95 cm (38″) and returns reliably year after year and requires little maintenance after planting. Just allow the foliage to die back completely. Easily grown in full sun to partial shade locations and well-draining soils. Plant the bulbs 10 cm (4”) deep, spacing them 30 cm (12”) apart. Hardy to Zone 5. Eremurus ‘Line Dance’ with its gleaming brush-tail spires of tiny pristine white flowers is a sight to behold in the late spring garden. The tiny white flowers are lightly fragrant and highly attractive to honeybees and butterflies. Blooming from the bottom up, the long sturdy stalks have a graceful sway about them as they tower over other plants in the mixed border. Commonly called ‘Fox Tail Lilies’ – one of the most impressive plants blooms from a most unusual starfish-like bulb. It is best planted in the fall, as the flowers develop following a cold period. Plant the bulb in a location that is sheltered from strong winds. Eremurus prefers fertile, well-draining soils and open, sunny situations without any over-shadowing plants. As early spring approaches a rosette of foliage develops, from which flower stalks appear and bloom for three weeks in late May to early June. ‘Line Dance’ grows 120 cm (48”) tall, and during the growing season requires consistent moisture. 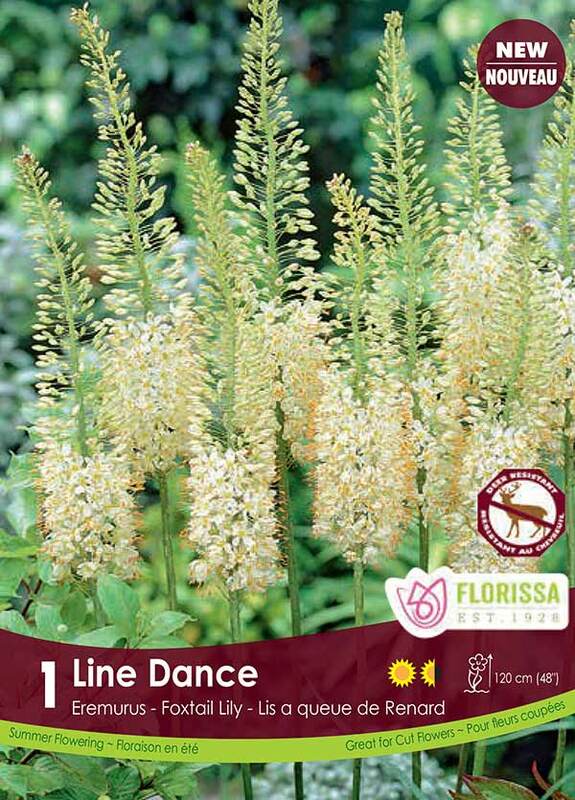 After flowering, reduce the watering as this deer resistant beauty becomes quite drought tolerant. Once established, Eremurus thrives on neglect and doesn’t like to be moved. The brush-tail spires make for excellent, long-lasting cut flowers and are elegant in summer floral arrangements. Gorgeous among fast growing tall grasses or situated towards the back of the perennial border. Hardy to Zone 5.